Posted: Tue Jan 10, 2017 3:33 am Post subject: Any rear camber tricks ??? Now that I've lowered the 924 about 4" to better its aero, I've found that the rear camber adjustment doesn't have enough slack to restore those wheels to zero camber. With all of the adjustment I can muster, I'm stuck at about negative 2 degrees. I've even tinkered with the toe and ride height to try to trick in some additional camber, but seem to have hit a wall at this point. Any ideas out there on what else I can do aside from doing metal surgery on the parts? While I suppose I can run the car as is, I'm a bit conserned with stability at high speed and traction loss under acceleration. In my world - 2degs is spot on for a track car, should be very stable if you got the toe angle correct. I haven't driven more than 230km/h on track and that was very stable, i have around - 2.9in front amd - 2 at the rear. For your land speed record car, you will have to modify the trailing arm inner bushing mounts to get to zero camber. Try elongating the bolt holes in the rear subframe assy. Thanks for the input. As I think through this interesting (and pretty doable) idea, I don't understand how (effectively) shortening or lengthening the trailing arms will create additional positive camber adjustment. In my mind's eye I can see it altering toe, but I don't understand how it will offset too much negaive camber. Can you give me a short tutorial? I'd really appreciate it. Vaughan has got it. Vertical adjustments to the inner trailing arm change camber and horizontal adjustments would change toe. I mean that you don't do anything to the trailing arm itself but elongate the mounting points on the rear subframe. Be careful though you're increasing the leverage on the trailing blade, I would consider the amount of flex/twist inflicted to the blade and the effect it has on suspension. I'm not saying its a bad thing to do, I'm just thinking that further elongating the holes may twist the trailing blade more and while limiting the camber gain because of blade flexibility it may also have an alternate effect on the suspension. From my point of view you're on uncharted ground if you do this mod. I did a similar mod(elongated holes) on the front end...my early struts to accept late spindles and keep early strut orientation while keeping camber in specs. It has held up well until now. I still dont get why you need so little camber? My experience is that if the car has the opportunity to flinch left or right(say a small change in grip) it will with 2.5deg of camber per wheel versus the more stable less camber alternative where the car feels less eager to flinch left or right when small changes in grip occurs. Would be very interesting to see how the salt bed is for a drive surface indeed. 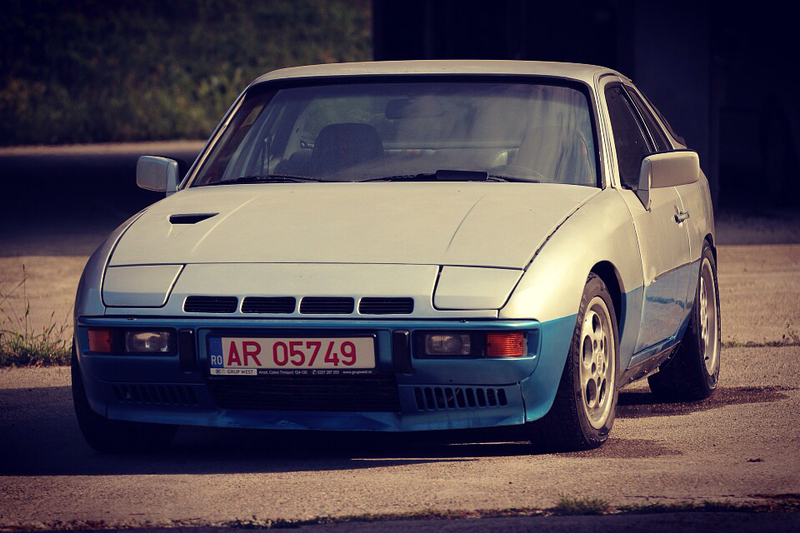 This is a very interesting application of the 924. First, thanks for addressing the direction of the desired elongation. Vertical movement would indeed address camber. To address some of the questions here, the Bonneville salt surface is anything but smooth. It's more on the order of a semi-smooth, hard packed dirt road with fault cracks that are generally not parellel to the direction of travel. Grip is pretty marginal and is exacerbated by the fact that you're running on tires that are quite narrow and which are generally somewhat rounded in profile. I'm currently running 4" wide Hoosier drag fronts on all four corners. As for speed, we ran roughly 150 at the exit of the second mile and averaged 141 for the mile (the record was 138). At that speed the car's handling was "interesting", with it drifting roughly six inches side to side at speeds above 125 at a frequency of about a half second. 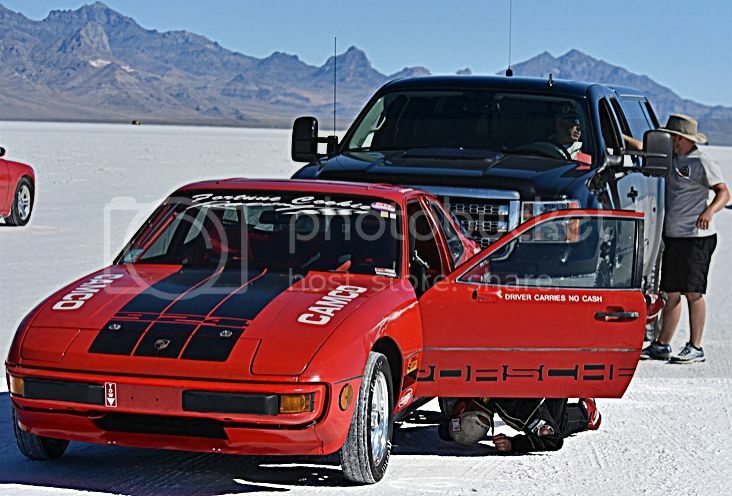 Land Speed racing tends to be a balancing act between traction and power. Land speed racers have a saying... "If it spins the tires, add ballast. If it doesn't, add horsepower". With the car lowered 4", adding Mooneye wheel covers and tweaking the aero here and there within the limits of the 2.0 liter Classic Production rules, we're hoping for a 150 average mile run this year. P.S. If I can ever figure out how to post a picture here, I'll do so. Thanks for the answer, very interesting setup indeed, 4" drags on "dirt", very different world of car racing. How limited are you when it comes to underbody areo mods? With 4" lowering, have you done anyhting to correct the front suspension geometry? If you havent I would start adressing these issues to significantly reduce bump steer and undesired camber changes. If you want you can drag and drop the picture files into my google drive folder, I can then uppload them to the board for you ! and try to drop them in your G drive. Thanks!